Phagocytic immune response. 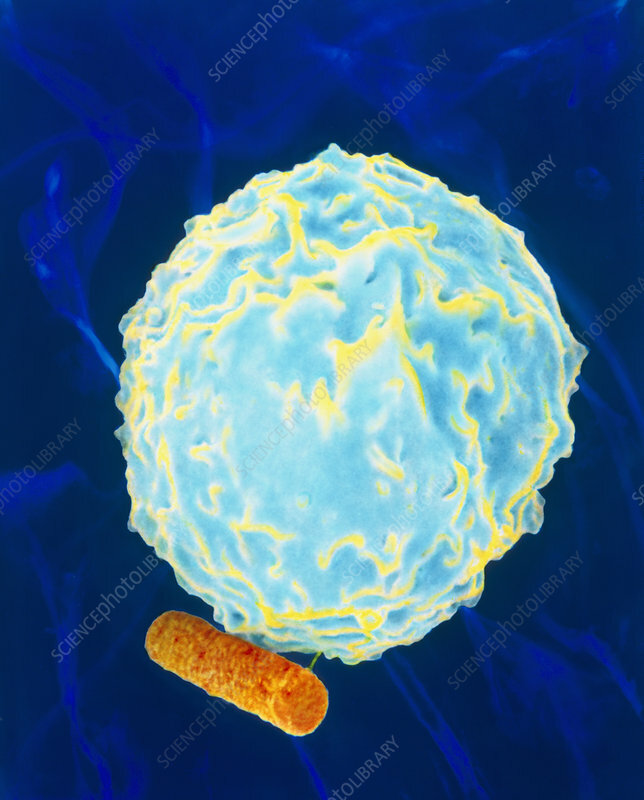 Coloured scanning electron micrograph (SEM) of a polymorphonuclear white blood cell (leucocyte) attacking a Bacillus cereus bacterium. The orange rod-shaped bacterium is seen on the surface of the larger, rounded white blood cell. The blood cell has moved towards the bacterium using protuberances on its surface. This is the first stage of phagocytosis in which the cell will engulf and destroy the bacterium. Polymorphonuclear leucocytes form 60-70% of human white blood cells made in bone marrow. Important in the immune system, they migrate to areas of tissue damage and engulf foreign bodies such as bacteria. Magnification x6,100 at 6x7cm size. Magnification: x21,000 at 8x10inch size.